After the debacle that was getting to the train station in Pisa to get to Florence, getting to the hostel we were staying at was pretty easy. I think it was probably around a 10 minute walk from the train station. We were the first people to check into the room so we got to pick our beds. We chose the bunk beds that were kind of separated from the other 2 bunk beds in the room. There was a semi-wall dividing us from the rest of the room and we liked it because, well, we weren’t sure if we’d get along with our roommates or not. 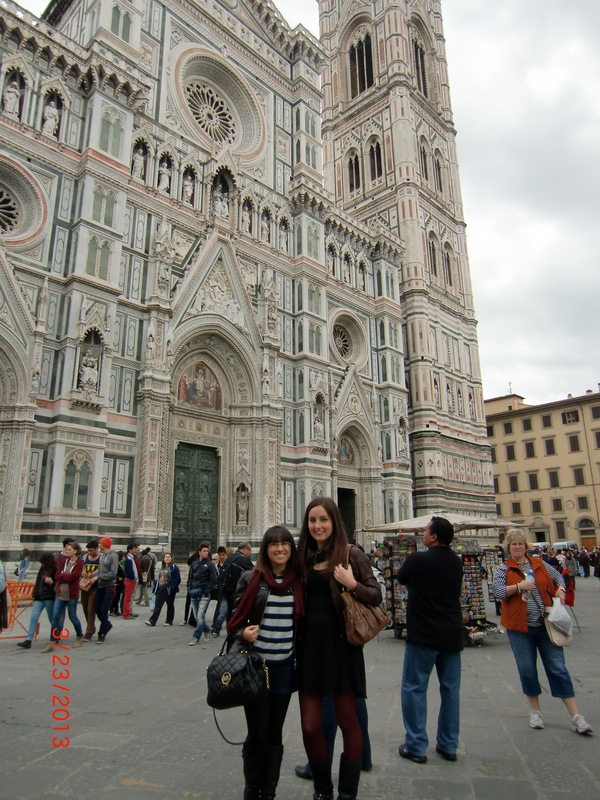 After unpacking all of our stuff, we went off to venture the streets of Firenze. We ended up walking through the Market of San Lorenzo, which was about 5 minutes from our hostel. Diana and I already had our minds set that we wanted to buy leather jackets while in Florence since the city is known for having great leather products. So the market was the perfect shopping place for them. We entered one shop and liked some of the jackets, but we were put off by the salesperson who was quickly becoming much to pushy and really trying to pressure Diana and me into buying the jackets. Since it was the first store we’d gone into we didn’t feel comfortable buying the jackets and were trying to explain to the man that we wanted to look around before we made a decision. He got visibly annoyed with us so we just decided to leave. Also, this was also the man who kept telling Diana that the coat she was trying on looked “great around your boobies.” We should have just left after that. We were only in Pisa for a short time, so we hadn’t really gotten exposed to a lot of Italian men/the comments these men make to women–especially tourists. The only comment I got in Pisa was from some rando on the street (who I’m pretty sure was another tourist – he didn’t look/sound Italian) that said, “Smell so sweet” as he passed by me. This kinda freaked me out because I could actually feel him when he was standing behind me sniffing me. Gross. The market of San Lorenzo/Florence, in general, quickly showed us why Italian men have such a notoriety. First of all, there were the men who honked at us when we arrived to Florence and were walking with our bags to the hostel. Then there was the comment the guy made about Diana’s “boobies” and then the comment I got from the guy at the second store. Diana and I only made it a few feet before we were beckoned into another leather coats store. This salesperson was younger than the first guy and he really was much more friendly. He was really helpful in helping us find the type of jacket we were each looking for. I was trying on my jacket and I said something in Spanish, which made him ask me where I was from. When I responded that I was from Puerto Rico, his reply was, “Ohhhhhh so that’s why you have that body.” I’m not even sure what I responded with or if I said anything at all. I think I just looked at Diana with an expression that said, “Did he really just say that to me? !” After this, he was trying to show us how great the quality of our leather jackets were and wanted us to feel a suede jacket that was on display on a top hanger. Diana, being taller than I am, easily reached up and felt the jacket. The man then looked to me and told me to touch it. I looked at him, looked up at the jacket, and then back to him and informed him that there was no way in hell my tiny self was going to reach. His solution to this matter was to bring me to the jacket rather than bring the jacket to me. He came over to me, lifted me up, and took me over to the jacket so I could touch it. After he put me down, he says, “Piccolina! You weigh nothing!” After some more back and forth and haggling of prices, we bought out leather jackets and were off on our merry way back to the hostel. 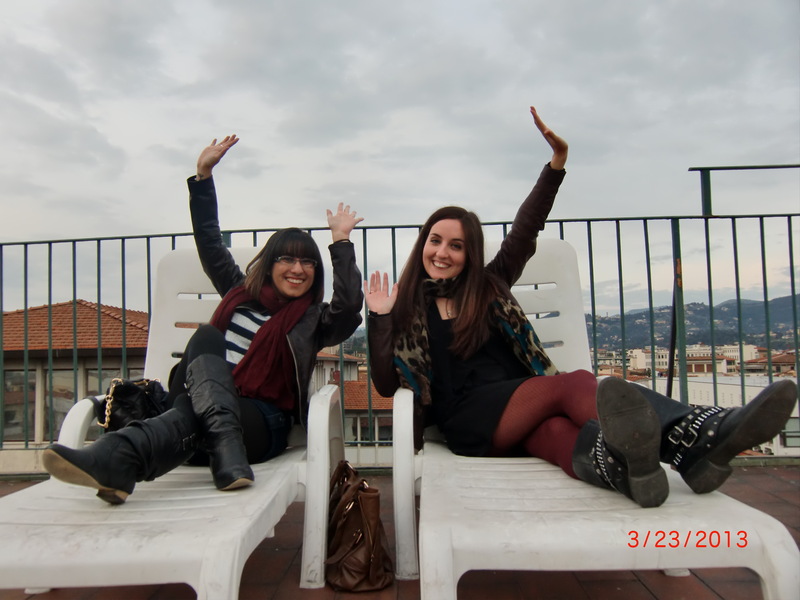 We didn’t do much else that day other than eat dinner and gelato. 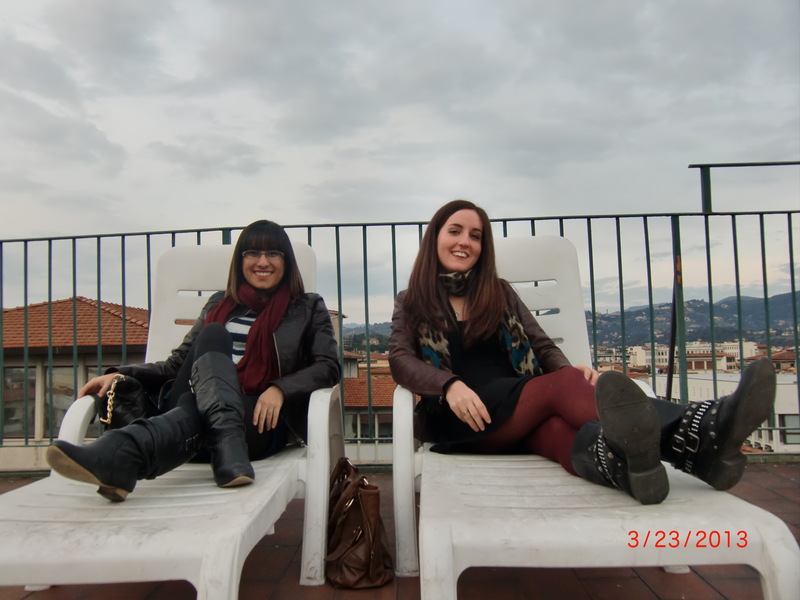 I have to mention the place where Diana and I got lunch in Florence because it was delicious! We went to a panini place called The Oil Shoppe. I only remember that I ordered whatever the number 9 panino was…and it was gloriousness. There was a guestbook there signed by a LOT of study abroad students. 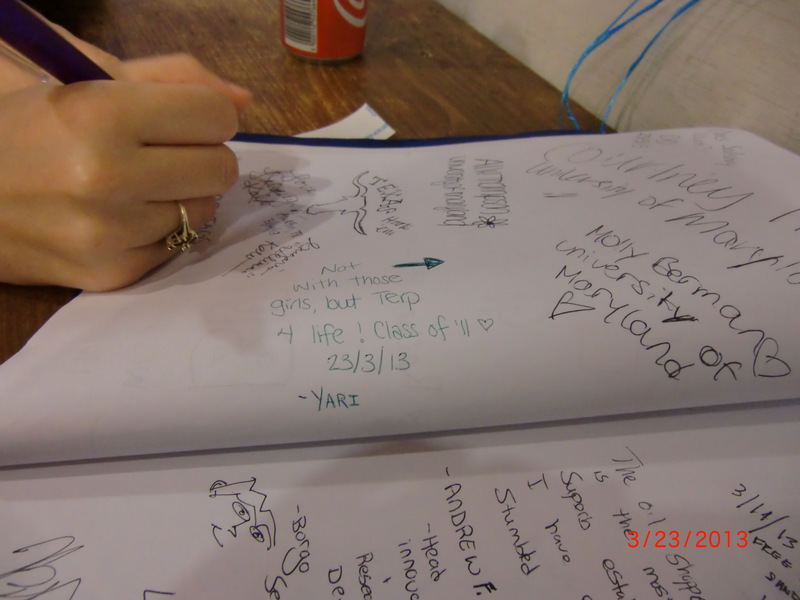 As Diana and I were perusing through it, Diana spotted a page signed by a bunch of University of Maryland students. I immediately looked for a pen so that I could sign on the page. I must also mention our dinner that evening. We were walking around trying to find a market that ended up being a complete and total bust. Diana then remembered that the pizzeria that the Jersey Shore cast worked at in Florence was in the area we were in. We went off to find it so that I can take a picture of it to send to my friend, Betty, who is from New Jersey. We found it pretty easily, a nice change to our constant getting lost. We were standing outside reading the menu, when I see that Diana starts laughing at something behind me. When I turn around, the cashier from the pizzeria has his head stuck out of the tiny window in the front and is telling us to come inside to eat. We had to go in after such a beckoning…and the pizza was SO good! So if you ever travel to Florence, I really recommend hitting up The Oil Shoppe and Pizzeria O’Vesuvio. I really wish I could remember the name of my favorite gelateria, but all I can recall is that it’s near Piazza della Signoria. I know I got the mint chocolate flavor and it was delicious!!! That’s pretty much a wrap on Florence. I’m not writing about all the days we were there because we didn’t do things that really merit being mentioned. And there are some stories that will go to the grave with Diana and I. We also took a day trip to Siena during our time in Florence so I’ll make that a separate post. There really won’t be much to say regarding Siena though. Then I’ll write up my Rome post which will probably take me awhile because we were there 4 days and we actually did do a lot there. If you read this entire post, thanks. I always end up skipping around when bloggers write posts this long. 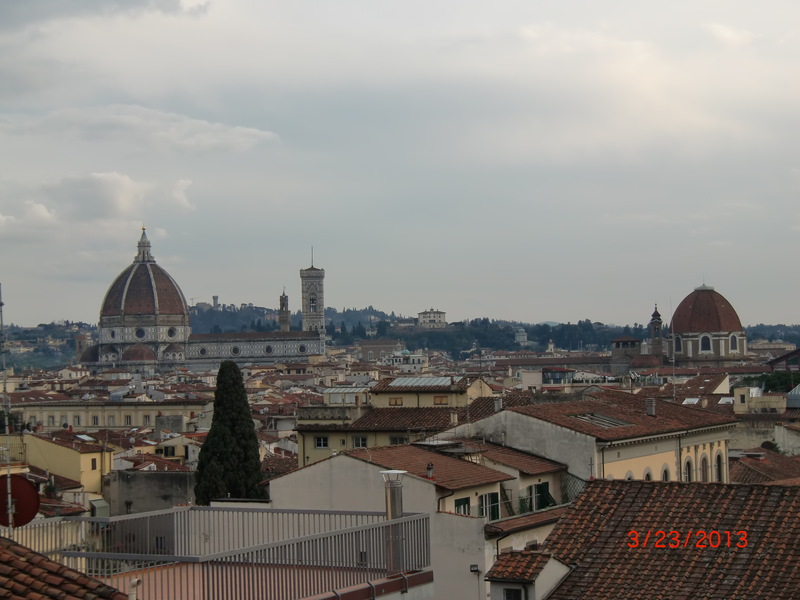 Have any of you been to Florence? What were your favorite/least favorite parts of your trip? 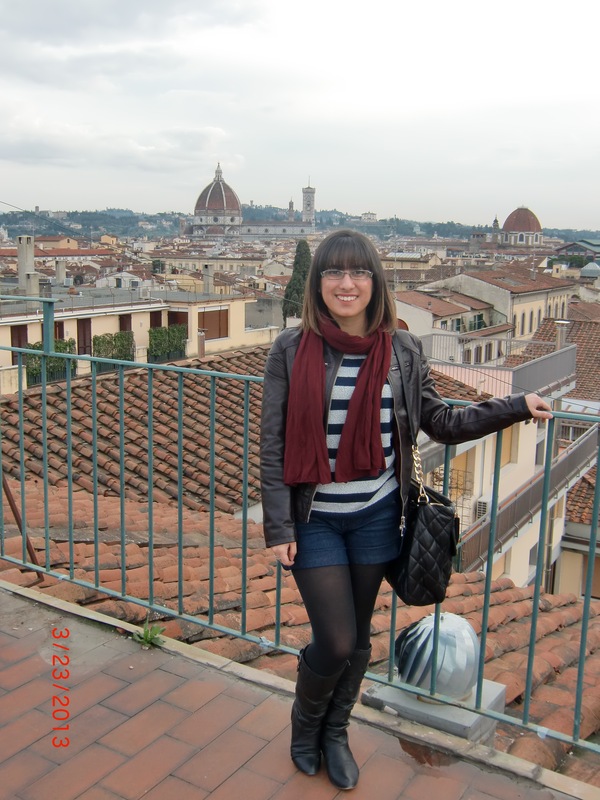 Previous Italia (Part 1) – PISA Next Learning to Leave. Yari, can you tell how you met your host fam? I used the site aupairworld.net. It’s a great site where you can contact potential families and they can contact you. It’s free and all you have to do is set up a profile page.